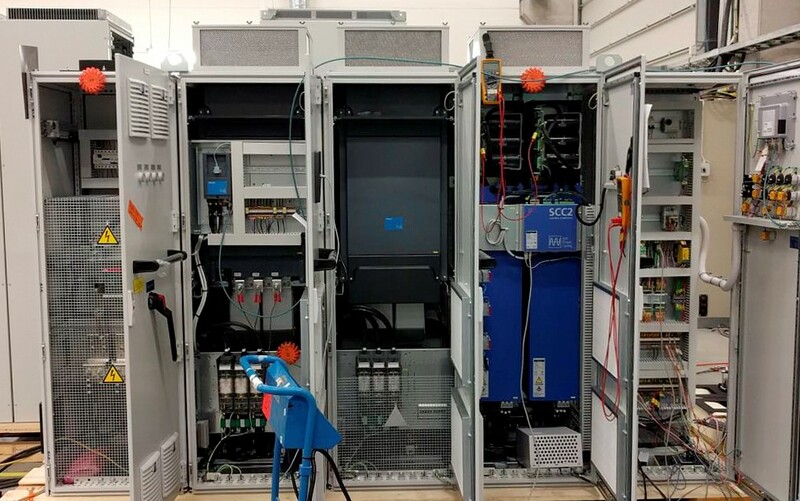 Comsys AB, based in Lund, Sweden, are one of the market leaders in active harmonic technology with over 3000 ADF filters installed across the world; on ships, drilling rigs and industrial and commercial applications. Within the ADF range is the World’s fastest harmonic active filter (ADF P200) which also mitigates harmonics to the 120th order. Comsys’s patented optional ADF sensorless control permits elimination of background harmonic voltage distortion and operation without current transformers. For the Comsys ADF corporate brochure please click here. 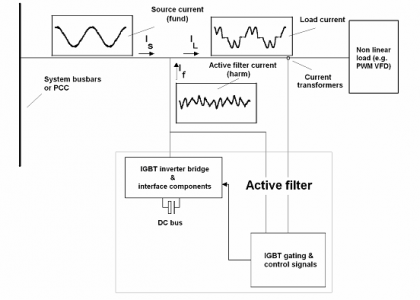 Active filters are very low impedance (<1%), electronic harmonic current sources which provide non-linear loads the harmonic currents they require to function. Without such devices, the harmonic currents would be drawn from the generator or transformer often resulting in excessive harmonic voltage distortion in the power system. ALL active filters require at least 3% AC line (or DC bus reactance) in each VFD in order to meet the <5% Ithd (total harmonic current distortion) performance specification. The lack of additional reactance in a rectifier load results in significantly more harmonic current drawn from the active filter than previously from the transformer or generator. This is due to the < 1% source impedance for harmonics of the active filter. For example, in VFDs, this additional current can be in the order of 50-100% for VFDs without additional reactance. With 3% AC line reactors installed, the ‘additional current’ is around 25% more but this additional harmonic current is usually designed into the current rating of the active filter. If correctly dimensioned for VFDs with no additional reactance, the active filter will be substantially larger and significantly more expensive than required had suitable AC line (or DC bus) reactors been installed in the VFD. The active filter performance will be significantly degraded (~10-12% Ithd) and will not achieve the <5% Ithd often expected. There are also issues when active filters are used with DC SCR drives where no AC line reactors are installed. Due to the inductive nature of the load (i.e. the DC motor armature) the additional current drawn when the active filter is connected is less compared to a VFD load (which is a capacitive load). However, if no AC line (or ‘commutation’) reactors are employed then high frequency energy in the DC SCR drive line voltage notches can potentially destroy the active filter’s passive carrier frequency suppression filter and render the active filter inoperative. Indeed, this was the biggest impediment to applying active filters to older rigs with mainly DC SCR drives. 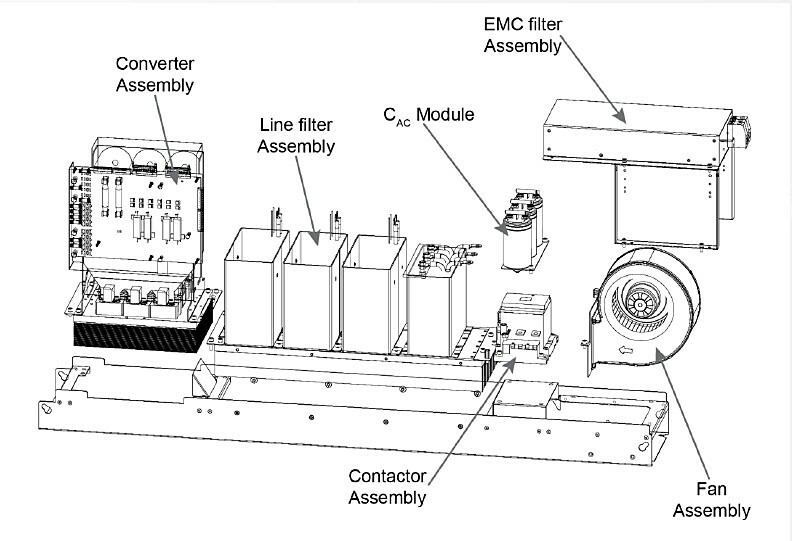 A combination of at least 4% AC line reactors and a fast response active filter can almost eliminate line notching, provide an excellent degree of harmonic mitigation resolve the carrier suppression filter problem and, if rated correctly, can also provide displacement power factor correction for systems with DC SCR drives. The Comsys ADF P100 series of relatively low-cost, compact active filters can be installed in their standalone IP21 enclosures on a wall in a factory, on a bulkhead or inside a switchboard. Their compensation ratings extend from 50A to 130A, all based on operating up to 50 deg C.
P100 series can be paralleled to a maximum of 15 units. The P100N is a four wire (4W) device, available only in 100A per phase/300A neutral. However, paralleling up to 15 units is also possible. In addition to harmonic current compensation, both P100 and P100N can provide simultaneous reactive power compensation as standard. For the datasheet on Comsys ADF P100 please click here. For the datasheet on Comsys ADF P100N please click here. The P200, available in 100A ratings, is the fastest active filter in the World. Where most active filters compensate to the 50th order, the P200 compensates to 6kHz (120th order at 50Hz or 100th order 60Hz). Up to 15 of P200’s can be paralleled. Rated up to 50 deg C ambient. The P200 comes with the option of sensorless (CT less control), wideband compensation and is often applied as an anti-resonant damper on applications which are subject to resonance (i.e. the P200 can be tuned in to prevent the resonance from occurring). P200 control panel – P200 can be used to prevent resonance and mitigate to 120th order. For the datasheet on Comsys ADF P200 please click here. The P300 is the modular, high-performance harmonics and PQ workhorse of the Comsys ADF range. Available in voltages from 380V to 690V and compensation ratings from 90A to 360A, the P300 can operate in ambient temperatures up to 50 deg C. No matter how onerous the application, the P300 can handle it. Up to 15 of P300’s can be paralleled up. Simultaneous reactive power and harmonic compensation available as standard. Both air cooled and liquid cooled P300 variants can be supplied. Door mounted display common across the ADF range. For the datasheet on Comsys ADF P300 please click here. The Comsys ADF PM300 is the P300 designed with OEMs and system integrators in mind. It allows them to install the filters into their own systems. It is supplied in component form as illustrated. In common with the P300 series, the PM300 is available with air cooling or liquid cooling capabilities for operation up to 50 deg C.
For the datasheet on PPM300, 90-120A ADF power processor modules please click here. For the datasheet on PPM300v2B, 50A-150A ADF power processor modules please click here. 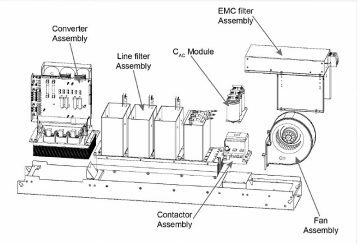 For the datasheet on PPM300W (liquid cooled), 140A-150A ADF power processor modules please click here. For the datasheet on SCC2 ADF Controller for 1-6 PPM modules please click here. 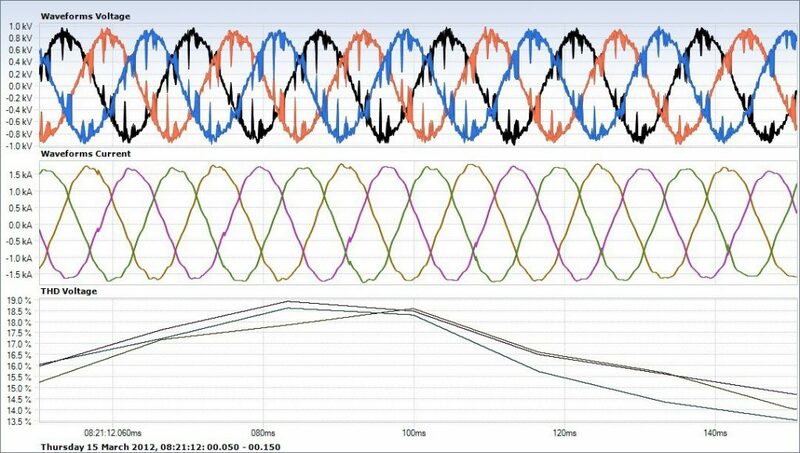 All active filters, including Comsys ADF series, attenuate the harmonic currents drawn by non-linear loads and indirectly reduce the harmonic voltage distortion due to the load(s) under mitigation. This requires the use of current transformers. 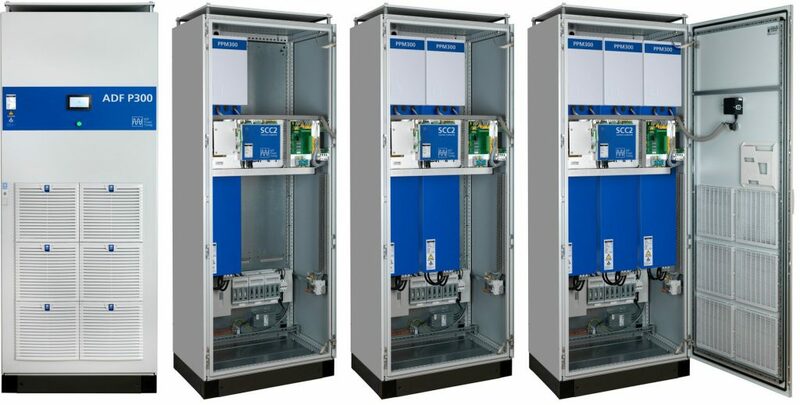 The range of Comsys ADFs also uniquely offer the option of ‘sensorless’ control, negating the requirement for current transformers. This can ensure that installation and commissioning is easier and quicker. 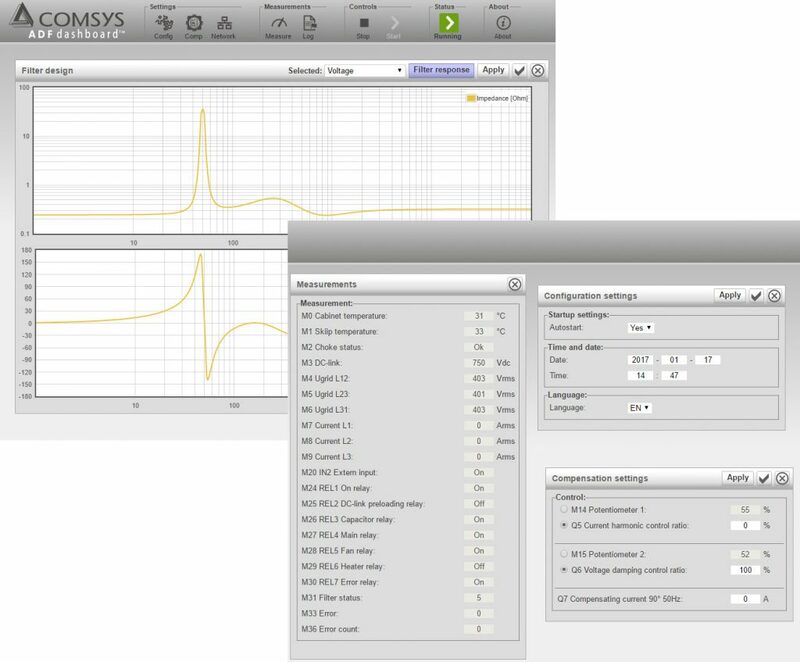 Another exciting application of Comsys ADFs ‘sensorless control’ is compensation of background harmonic voltage distortion (Uthd) which effectively isolates it from loads downstream. This is essentially ‘voltage reconstruction’. This is of particular importance on drilling rigs and production platforms where large AC VFDs and or DC drives may result in excessive harmonic voltage distortion and other disturbances, which propagate through transformers to lower voltage consumers (including ROVs), disrupting or damaging susceptible or sensitive equipment. Comsys ADF sensorless control effectively isolates the excessive Uthd from LV supplies. An example of excessive Uthd on one generator (three were in parallel) on a drilling rig can be seen. The combination of the 18.88% Uthd and severe line notching propagated through the localised power system via the transformers, adversely affected other equipment. 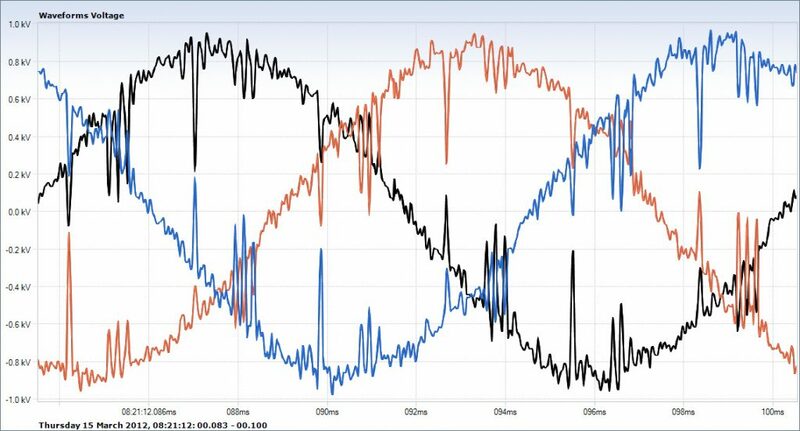 The problem of excessive Uthd is also common on production platforms and FSPOs which have large, multiple VFDs on compressors, pumps and ESP applications plus AC or DC drilling packages. 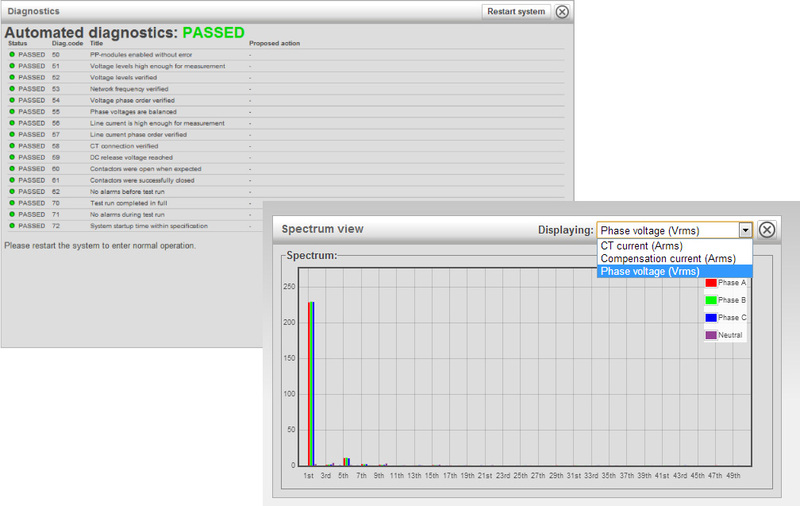 The spectrum below was captured at the 600V drilling package (DC SCR drives) on one platform. The Uthd was 29.71%, of which 21.27% was above 21st order due to 11MW of 24 pulse ESP VFDs connected to the 11kV busbars. Some 12.2% Uthd below 21st was also due to the 24 pulse ESP drives, all of which transited across the 11kV/60V transformer to the drilling package as background Uthd. (The recommended total harmonic voltage limit on the installation was 5%). The high Uthd and more importantly, the high frequency harmonics pose safety issues on explosion proof motors. PTB calculate, for example, an additional temperature rise of 23% based on the voltage spectra, possibly exceeding the motor’s temperature class and jepordising safety. 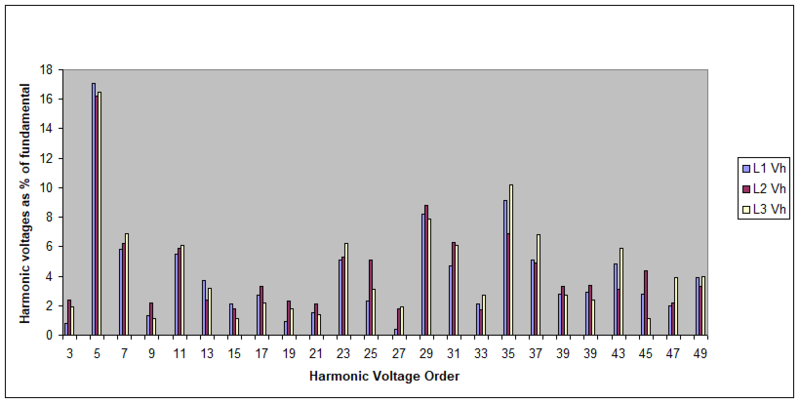 If PQ problems are due to background voltage distortion it may not be feasible to treat the harmonics at source. The alternative is to isolate the voltages supplies which are being directly affected by the excessive background distortion by connecting a suitably dimensioned Comsys ADF filter(s) in parallel on the secondary side of the transformer(s) which supply those loads. 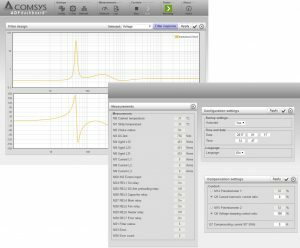 This results in Comsys ADF sensorless control eliminating or significantly attenuating ‘background’ distortion or, it could be stated, effectively isolating the affected loads from the background voltage distortion. 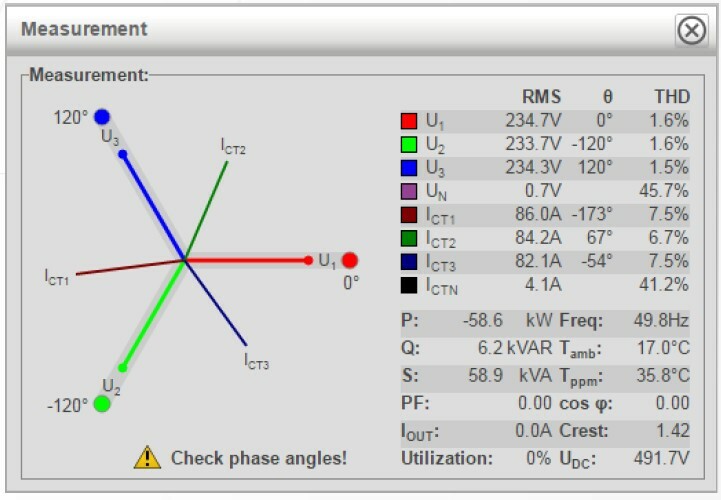 If you have problems with LV equipment, possibly due to high background harmonic voltage distortion please contact us. 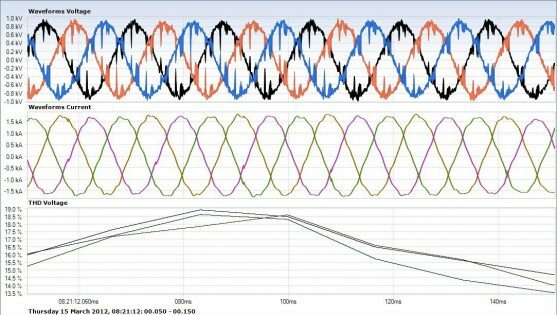 Active filters, when applied correctly, are an important tool in the harmonic mitigation toolbox. However, no form of harmonic mitigation is perfect. The secret of success is recognising the pros and cons of all types of active (and passive) mitigation and being able to apply the most appropriate form of mitigation for any given application. 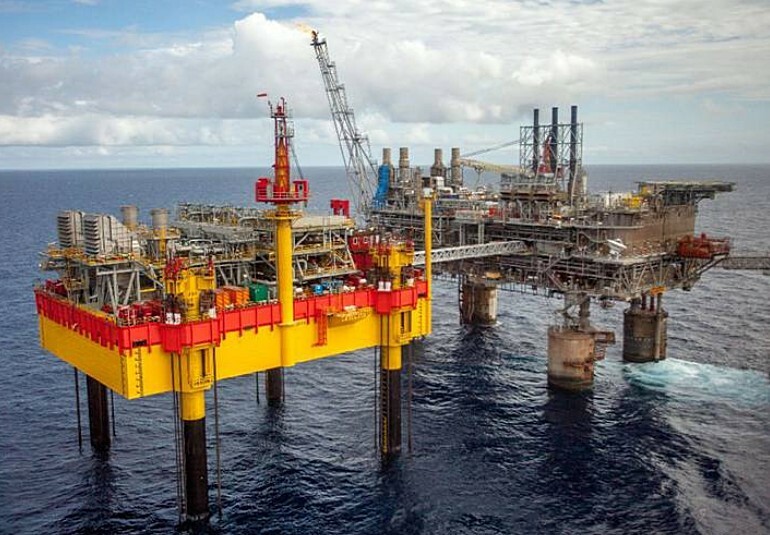 The staff at Harmonic Solutions Oil & Gas have been involved in applying active filters since 1996 and have applied active filters to a large number of demanding marine and offshore applications. A complete range of accompanying AC line reactors for active filters to 3000A can also be supplied, if required. Contact us with your application details and let us help you.